Does the concept of popular literature seem like an oxymoron? Can a book sell well in today’s pop culture, while still displaying a high degree of literary quality? The answer is a resounding: Yes! 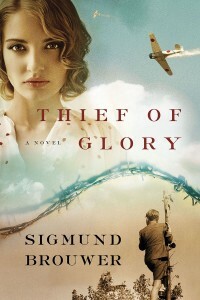 This week I read a newly released book by prolific author Sigmund Brouwer that evidences excellent literary quality and is sure to skyrocket off the sales charts. A banyan tree begins when its seeds germinate in the crevices of a host tree. It sends to the ground tendrils that become prop roots with enough room for children to crawl beneath, prop roots that grow into thick, woody trunks and make it look like the tree is standing above the ground. The roots, given time, look no different than the tree it has begun to strangle. Eventually, when the original support tree dies and rots, the banyan develops a hollow central core (Thief of Glory, p. 1). That’s lovely writing, but the reader finishing the story realizes how masterfully Brouwer crafted those opening lines. I felt a bit of this when I finished Thief of Glory, but primarily it encouraged me that Christians can write stellar books for popular consumption. Books that shine with literary quality while subtlety conveying faith and truth. Sigmund Brouwer excels at writing for the popular market. For more information about him, check out his about page on his website or look up his Amazon author page. I might Have to pick this book up! Glenda — this sounds like great writing — I’m a bit weary of Christian novels that are devoid of any substance to their words — and are at the level of a 4th grader. Thanks for sharing this!